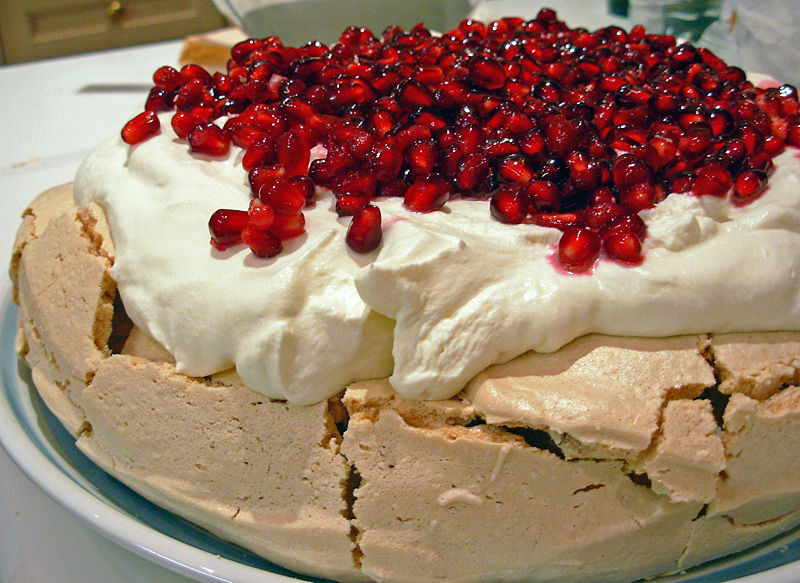 Pavlova is a meringue-based dessert named after the Russian ballet dancer Ánna Pávlova. Colloquially referred to as "pav", it is a cake of meringue with a crispy crust and a soft, light interior. 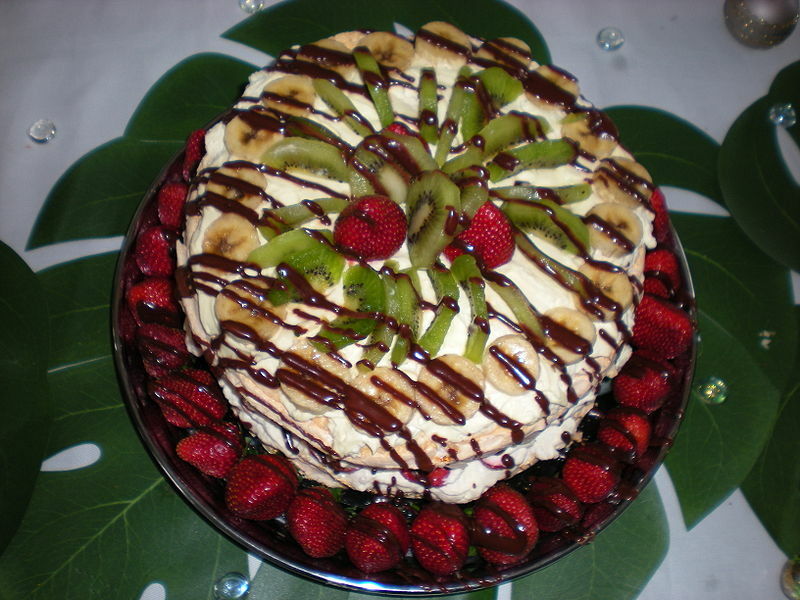 Left: A pavlova garnished with strawberries, bananas, kiwifruit and cream. The dessert is believed to have been created to honour the dancer during or after one of her tours to Australia and New Zealand in the 1920s. Where it was created and the nationality of its creator has been a source of argument between the two nations for many years. The dessert is a popular dish and an important part of the national cuisine of both countries, and is frequently served during celebratory or holiday meals such as Christmas dinner. Pavlova is made by beating egg whites (and sometimes salt) to a very stiff consistency before folding in caster sugar, white vinegar, cornstarch, and sometimes vanilla, and slow-baking the mixture to create the meringue. This makes the outside of the pavlova a crisp crunchy shell, while the interior remains soft and moist. The pavlova's internal consistency is thus completely different from that normally associated with meringue, having more of a soft marshmallow texture. Pavlova is traditionally decorated with a topping of whipped cream and fresh fruit of sweet/tart flavours, such as strawberries and kiwifruit, or passionfruit and banana or berries and peach slices. Raspberry is a popular topping in the United Kingdom, with the tartness of raspberries contrasting with the sweetness of sugar. Left: A homemade pavlova decorated with pomegranate arils and Chantilly cream.